Deluxe Aligner™ Kit includes three 4" Diamond Whetstone™ in Coarse diamond (45 micron / 325 mesh) to quickly restore a neglected edge, Fine diamond (25 micron / 600 mesh) for a razor sharp edge, and Extra-Fine diamond (9 micron / 1200 mesh) to polish and refine a razor edge after sharpening with a coarser diamond stone; a Serrated Knife Sharpening Accessory Fine diamond to hone serrated edges; and fabric storage pouch in which to carry the Aligner™ components. Easy-to-follow instructions included. Sharpening with diamonds is fast and easy. No messy oils needed—sharpen dry or with water. Durable construction will provide years of consistent performance and reliable service. 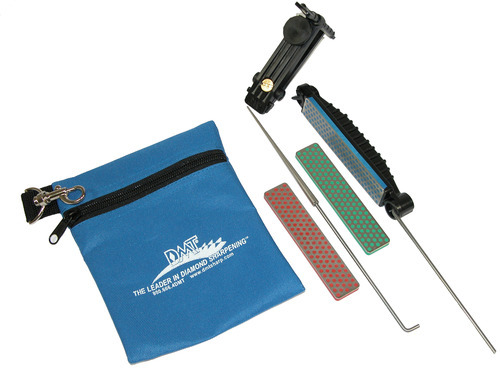 For proper tool maintenance, woodworkers, chefs and other professionals rely on the superior quality and versatility of DMT® products. Made in USA.